Big Bud is an essential part of your high-yielding bloom phase. Get Big Bud today and watch your flowers expand. Piranha Beneficial Fungi liquid is a powerful weapon against Nematodes disease mold and mildew. 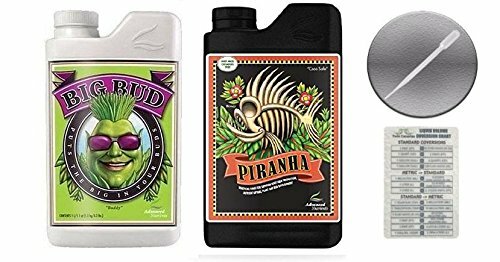 When used as a foliar spray Piranha protects against gray mold mildew Pythium Rhizoctania solani Fusarium Sclerotium rolfsii Sclerotinia homoeocarpa and other microbes that that can harm your plant's leaves and flowers. If you have any questions about this product by Advanced Nutrients, contact us by completing and submitting the form below. If you are looking for a specif part number, please include it with your message.